We are a group of over 6000 health-conscious, like-minded people worldwide — from corporate professionals to holistic hippies — who all have one thing in common: We all fell in love Young Living™ Essential Oils the first moment we tried them. We prioritize our health and understand that our own health is intertwined with the health of our families, our communities and the planet. That’s why we pride ourselves on doing whatever we can, within our ability, to live our lives in the most natural, non-toxic way. The improvements that Young Living™ Essential Oils and other Young Living™ oil-infused products have had on our health & happiness have been life-changing not only for ourselves, but also for our children, spouses, friends and even pets. Because of this, some of us choose to simply use our oils, while others choose to share them as well! And sharing Young Living™ products gives you the opportunity to create residual income for yourself & your family. Talk about a win-win! Anyone interested in Essential Oils, whether you’re just starting out or have years of experience, can benefit from joining our Sprucer Tribe! EXCLUSIVE SPRUCER RESOURCES & GIFTS! This is our Exclusive Trail Guide given to our members - from our members as a Special Thank YOU for joining with our Tribe! 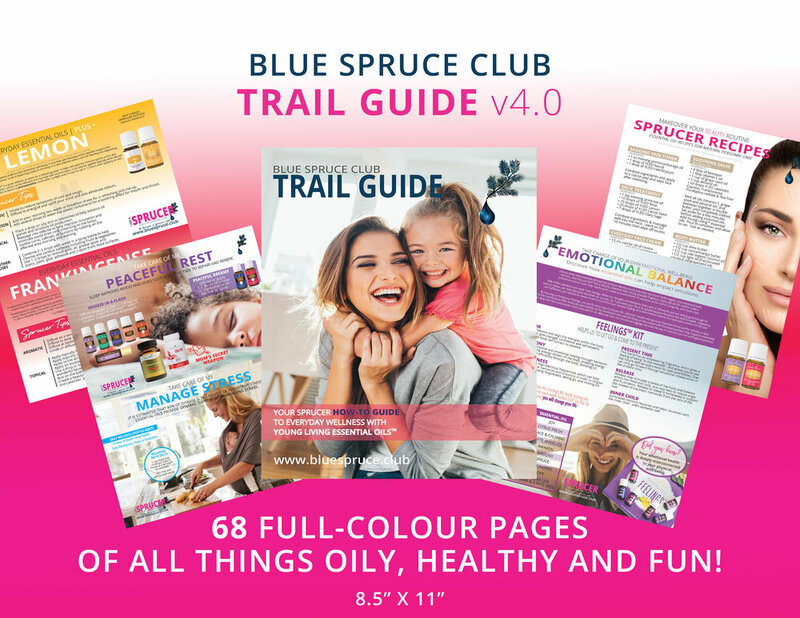 This is a huge, FREE (to Sprucers) knowledge database of amazing resources: tips on the best ways to use oils and other products, videos, recipes, holistic health info, and gain access to incredible tools and merchandise only for Blue Spruce Club members! You’ll get invited to our top-secret Facebook group, where we keep up to date with all the other Sprucers and share tips and ideas, ask questions, and post private events and webinars. You’ll have access to monthly online education workshops, and get ongoing support with our Monthly E-Newsletter! Classes just like this one, and advanced educational classed monthly with topics that range from oils outside of the starter kit, make and take classes where you come and make items (i.e. lotion, detox bath, linen spray, etc.). Plus, you are invited to our HUGE Annual Sprucer SOAR Conference... think MINI (or not-so mini) YL Convention - Sprucer-Style! Speakers, SWAG, and TONS-of-OILY-FUN! 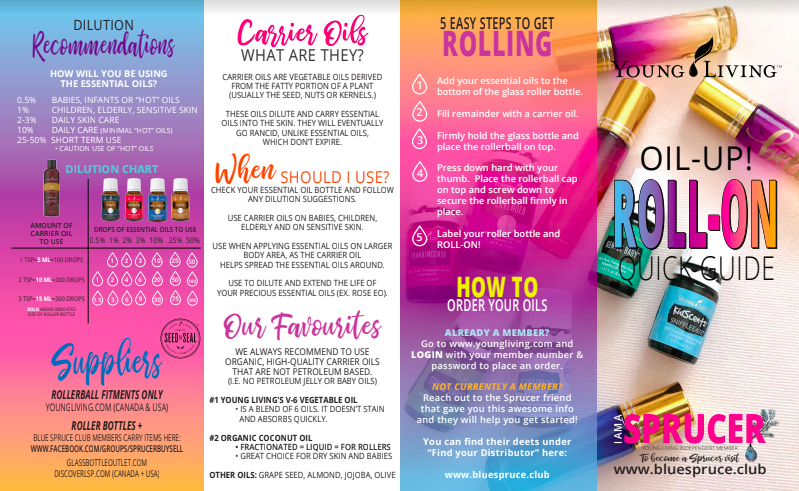 If you’re looking to share the oils with others and make an income, an exclusive BIZ section with editable marketing materials, PowerPoint presentations, and so much more will be at your fingertips! Remember you can be a member with our team without having to share the products; however, click here to learn more if the biz opprotunity speaks to you.... I'm curious about this biz.